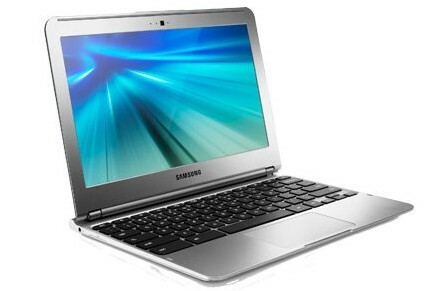 Consumers could soon have some new choices when looking for a Chromebook. PC World’s sources suggests that a Google(s goog) representative will be on stage during Wednesday’s Intel(s intc) Developer Forum keynote and will introduce new Chromebooks that use Intel’s fourth-generation chip, called Haswell. I haven’t heard anything specific about any such products but I will suggest that the timing is right. There haven’t been any new laptop models running Google’s Chrome OS software in months; possibly because hardware makers all knew that new Intel chips would be available by now. Indeed, Apple’s(s aapl) MacBook Air line was refreshed in June as one of the first computers to get the Haswell chip which promised better battery life for devices. As a result, a 13-inch MacBook Air can now run for up to 12 hours on a single charge. The Haswell chips are now more widely available and various computer makers are using the silicon in new PCs. Until now, however, Chromebooks have used older Intel chips or, in the case of Samsung’s $249 Chromebook, an ARM(s armh) chip that would typically be used in a smartphone or tablet. One exception is Google’s Chromebook Pixel, which is powered by a third-generation Intel Core i5. In terms of raw performance my Pixel provides a much better experience than the prior Chromebooks I’ve bought and can easily power its 2560 x 1700 resolution touchscreen. But the Pixel costs $1,299 to start. Where are the Chromebooks that offer better performance than the $250 models but only cost $500 to $700? My gut says that if Google announces anything on Wednesday, it will be a Chromebook at this price range, running on a low-power Haswell chip. It’s possible that the Pixel sees a refresh as well, as it could stand to gain some extra run-time: I only get 4.5 to 5 hours on a charge with my Chromebook. Many people laughed when the Chromebook was first released. Well, they’re still around, and Google keeps improving them while adding more hardware partners. These new improvements should give them an even bigger boost. There’s nothing to install on the Chromebook, so AccessNow is easy to deploy and manage. I stopped to use Window laptops few months ago, a Chromebook is now everything that I need… just a Chrome OS friendly printer is my only need. I still believe that ARM-based Chromebooks have the potential to bring a high performance in a light, fast and cheap device. I just expect Samsung bring a new generation of ARM-based Chromebooks using its new Octa-core processor, a little more RAMs and a higher resolution screen… and… no forget a NFC chip. Hey kevin the chromebooks look cool. will they be armoured with windows 8 will be a question. Armoured with Windows 8? Chromebooks run Google’s ChromeOS. Working at the desk with a Dell UltraSharp U2713HM with 2560×1440 Pixel I would not take a mobile Display/notebook/Tablet not as sharp. And the format of the Chrome Pixel with its “huge” pixel height (compared to all those video oriented 16:9 panels is another attractive point. But it does not need high speed power for me as I only do normal browsing and light text editing. When the new Chrome notebooks could be substantially cheaper as the Pixel they would be a nice alternative to the light ultrabooks that for instance Samsung sells with ultrasharp panels (and matte too!). What about batteries? Say for the Samsung Chromebook. When the battery goes out, is there any way to order a replacement? maybe the mid range could be a price reduced pixel if a new one is released? We’re an all-Chromebook household (except for a Vizio CA27-A0 for just my wife and I) and have never been happier. Have a few hooked up via HDMI to the kids’ TVs (where they watch everything using YouTube and ABC.com, etc.) and a few for my wife and I.
Oh, and we’re using the lowly (but incredibly speedy) Acer C7. Total cost: $800. Total headaches: 0. Windows 8, except for one large-screen desktop, is a thing of the past in our household. Everything we do for work or school is on Google Docs and Drive. Looking forward to a newer mid-range Chromebook that lasts 10 hours or so on a charge. Thanks for the consistent Chromebook coverage, Kevin. It’s where I look first!